New Delhi: India has set up an expert panel headed by Nandan Nilekani, co-chairman of software giant Infosys Technologies Ltd, to review the pension regulator’s plan to extend a pension package to the private sector. The group will submit a report by this month-end, said D. Swarup, chairman, Pension Fund Regulatory and Development Authority, or PFRDA, pension regulatory body. 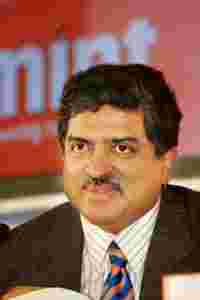 “We have formed an expert group under Nandan Nilekani to review what PFRDA has done so far. It will submit a report by this month-end and may also suggest improvements to the existing NPS (new pension system) architecture," he said. Nilekani couldn’t immediately be reached for comment. PFRDA, set up in 2003, was asked by finance minister P. Chidambaram in August to extend its pension package, which is currently offered to central government employees who joined after 31 December 2003, to the private sector. “The deadline is 1 April 2009," Swarup said on the roll-out. Currently, insurers offer pension products to everyone during the accumulation stage—when people save through pension funds that are invested to generate returns. PFRDA plans to compete with insurers, not by setting up a parallel distribution network, but by using the existing one. According to Swarup, the NPS roll-out to the private sector will piggyback on the existing infrastructure that is used for other investment avenues and where the intermediaries are already regulated by statutory regulators such as the Reserve Bank of India. The NPS distribution will be carried out by entities that only have to get themselves registered by PFRDA, which will not license any one of them. Banks, depository participants and, possibly, post offices are expected to be distribution outlets for pension products offered under PFRDA’s supervision. The distribution outlets would be linked electronically to NPS’ central record-keeping agency run by National Securities Depository Ltd and pension fund managers. At the centre of the new architecture suggested by PFRDA is the direct-selling model. The pension regulator has avoided using agents to avoid problems associated with mis-selling and to cut costs to investors, Swarup said. As the accumulation stage for pension funds lasts the working life of a customer, a percentage point difference in costs can make a significant difference in the final corpus. Piggybacking on existing infrastructure, as against building new distribution infrastructure, is expected to bring down costs borne by investors. Even while agreeing with PFRDA’s aim of keeping pension fund costs under tight control, independent experts feel that as a first step, it might be more important to raise awareness among potential customers about the need to start saving early to meet pension needs. “Convincing younger people to save for retirement is a very big challenge," Gautam Bhardwaj of pension research agency Invest India Economic Foundation (IIEF) said. IIEF has mapped saving and investment habits of Indian households. One of their studies found that on a voluntary level, around 4.5% of working people save specifically for retirement. According to Bhardwaj, it is very difficult to convince young people to save for retirement. To get mass coverage in NPS, a strategy of actively reaching out to people might be needed, he said. Bhardwaj’s take on NPS loosely echoed the life insurance industry’s dictum: Insurance is never bought, it is sold. PFRDA, however, has to roll out NPS in the face of a challenge. Among the financial sector’s regulators, it is the only one without statutory status. A Bill introduced in the Lok Sabha in 2005 to give it a statutory status was not cleared immediately. The government could not reintroduce it in the past three years on account of opposition to some contents of the proposed legislation from communist parties that had offered parliamentary support to the government till July. The pension reform Bill is likely to be reintroduced in Parliament in the ongoing session, finance ministry officials had earlier said. Regardless of the fate of the Bill, PFRDA has designed the architecture of NPS to account for its lack of statutory status. For instance, a statutory regulator acts as a quasi-judicial body and punishes market participant for violations. PFRDA cannot act as a quasi-judicial body till it gets the statutory status. In view of this gap, the NPS architecture is being built by concluding contracts with intermediaries that can only be enforced in a normal court of law, Swarup said. However, the contracts are framed in such a way that penalty for violations is built into them, he added.